This wooden exterior door has been framed with four panels. Each of the panels are equal in size. Two are placee above the door's mid rail and the other two are below. Each panel stands on its short side, and each is raised. Bolection, a type of molding used to join panels to the surface of doors, trims each panel. This door has a brass door handle with a thumb lever to operate the door's latching mechanism. Additionally, a brass escutcheon surrounds the keyhole and protects the door. The door has been finished in a glossy black enamel. 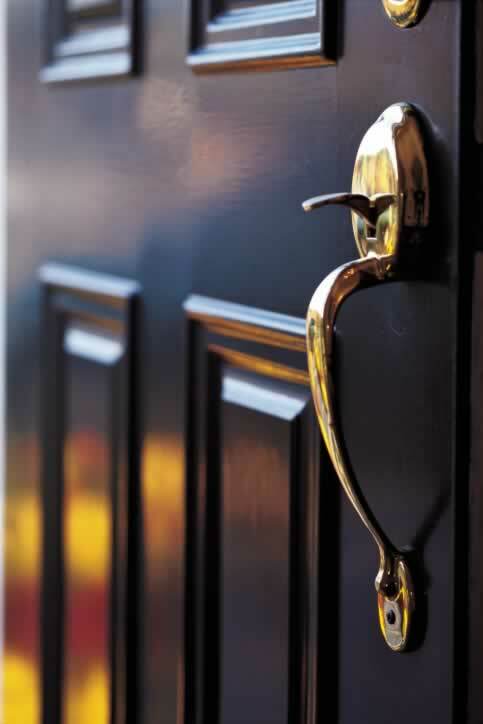 Matching polished brass hardware such as a classic door knocker would be a good addition to this door. Though door knockers have largely been replaced in function by door bells, many homeowners opt for door knockers for esthetic reasons. Another hardware option would be a polished brass kick plate, which is a particularly good choice for protecting the door's finish from being scuffed.